Dr. Jin Kyu (Suh) Robertson started out as a factory girl at a Korean wig factory, and immigrated to America as a housemaid at the age of 22 speaking little English and with only $100 to her name. Overcoming incredible odds, she became an officer in the U.S. Army, retiring as a Major with a Masters degree from Harvard University, and later received Ph.D. degree also from Harvard. Not only major Korean television broadcasting companies made documentaries of her life, but the Korean government even recognized her as one of the most influential overseas Koreans in 2008. Jin is a bestselling author (over a half million copies sold) and a most-sought-after motivational speaker (over 500 keynote speeches delivered) in Korea. She is also a radio talk show host of Voice America/World Talk Radio in the U.S. (www.voiceamerica.com/worldtalkradio). She is committed to reaching out to the world to inspire and motivate billions of people also reach their dreams. Jin is currently preparing for her book to get published and ready to deliver inspirational keynote speeches in English throughout the world. 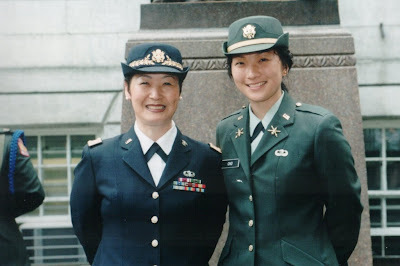 Major Jasmin Sung-ah Cho grew up under a single mom as an Army Brat. She had many challenges from moving practically every year throughout the world. Yet, she was selected as a Presidential Scholar (an honor given to only 141 of 2.5 million high school graduating seniors), graduated from Harvard University, and was commissioned a Second Lieutenant in the U.S. Army in 2000 through the Reserve Officer Training Corps (ROTC) Program. She is fluent in English, Korean and Japanese and now is studying Chinese. Jasmin is currently pursuing her master’s degree in international relations at Princeton University, and is training to be a U.S. Army Foreign Area Officer for Northeast Asia. She will serve in Japan upon graduation from Princeton. This is awesome! Wonderful achievements!